Fans of shoot-em-ups, have we got something to tell you about! To be honest, though…I’m not a fan. I never had too much fun with the ‘move-fire-madly-flip a switch-next level’ stuff, having thoroughly taken part of such excitement (and passed a ton of quarters) to the stand-up arcade monsters of the 1980’s. I didn’t relish the possibilities of this title much, but every so often even the most anachronistic wargamer should poke their head out of their board game dungeon and try their hand at a little action. So here is Operation: Blockade. While a shoot-em-up, it is deftly clever at covering up its own inadequacies, simplistic ideas, and never-changing worldviews, by injecting a hot load of steel-and-fire addictive game play. The gamer will probably be disappointed in some aspects of this title, but that should be balanced through some surprisingly attractive graphics and cleverly manipulated sound. The gamer takes the role of a special operative for the United Sovereign States, who happens to be at war with the big, bad (and Nazi-like) Saruvian Empire to the north. The era is reminiscent of the 1930’s and 40’s, and while the names of the countries have been changed, the enemy’s weaponry, vehicles and troops are strikingly similar to that of the German war machine of World War II. Since the Saruvian Empire has overrun most of the UST, leaving only a tiny cluster of useless, nut-hard islands to the south (like lots of little Corregidors), desperate times call for desperate measures. The gamer is sent to a small island (and I’m talking small here, since you could spit across it…well, electronically spit anyway), where they take up a position in a small turret-like bunker in the middle of this island. And oh, by the way, this island just happens to be smack dab in the middle of the Saruvian’s supply routes that keep their hugely powerful and successful war machine in occupied UST fed, clothed, and jackbooted. Your mission: sink things, shoot things down, machinegun enemy infantry, and repeat ad nauseum. 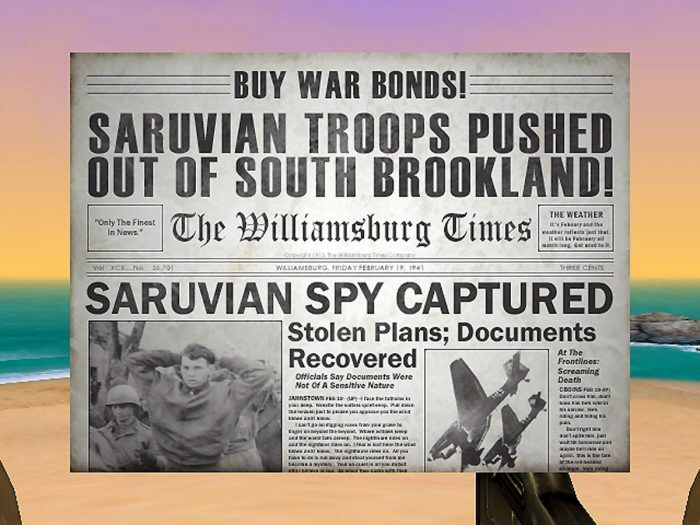 The names are silly, but the newspapers that appear after every “special” mission do add a little interest. You start with a Thompson sub-machine gun, a .50 caliber machine gun, and a howitzer. And no, it’s not too much for a soldier of your caliber to handle. After all, you’re the UST’s last hope for victory. And you’d better learn fast, because you won’t see much instruction in the documentation. However, the premise is relatively easy to figure out. I ran out of ammo twice before I realized you could sink enemy transport ships or shoot down their transport planes to re-stock your supplies (the game tells you “You’ve scrounged ammo and medical supplies” – I wonder how, in the middle of battle, you can do that). Once I figured it out, I never ran out again. Even more impressive is the fact that some units are more vulnerable in certain areas. For example, aiming your AA guns at a plane’s wings (especially with the Junkers transport or any of the bombers) will shoot them down faster than simply walking your hits across their fuselage. Also, using the howitzer on a larger ship below the main deck (against the hull itself) will sink it faster than simply lobbing shells at the superstructure – although if your aim is good, you can blow away individual gun emplacements, making their fire less effective against you. A sinking cruiser blows before its final descent, sending two PT boats scurrying for safety. Later in the game, you get a bazooka (and the enemy starts landing tanks on the island in LST’s before you can wonder “Gee, I wonder why I have this thingy?”), and also get your .50 cal machinegun upgraded to a quad .50 cal. Later, you enjoy a 20mm dual cannon instead of a quad machinegun to shoot down airplanes. The enemy improves with time as well. You’ll face the ME109 (yes, they use real-world nomenclatures for their units and not some phony made-up names) first, and then late in the war the Saruvians will throw ME262 jet fighters at you. Either way, shooting things down and mowing enemy infantry like tall grass is a true joy for those gamers wishing to blow off a little steam. The graphics are good, and especially sharp with regards to aircraft; clicking the right mouse button and holding it brings up your binoculars, and you can make out pretty decent detail on them. When they explode, they don’t just turn into an electronic smudge; they burn, baby, like a mad 4th of July display. Planes disintegrate in the air as your .50 cal chews them up, and the first time I saw a Ju87 come apart at the wing as it was diving on me, explode in flames, and crash loudly not a few feet from my position. Ships blow in somewhat impressive pyrotechnic displays, and if you had time to watch (and you do early on), you can see upper superstructures in the larger ships fall over as the ship keels over; ships don’t all die and sink the same way, adding to the interest. And the infantry…well, let’s just say if you’ve seen Saving Private Ryan, you’ll get to instill on the Germans…err, Saruvians (sorry, gotta get that straight) some small psychological US-of-A revenge for the first few minutes of that film. Water splashes, fine red mists appear, the men fall in different ways…war is hell. A joint assault. 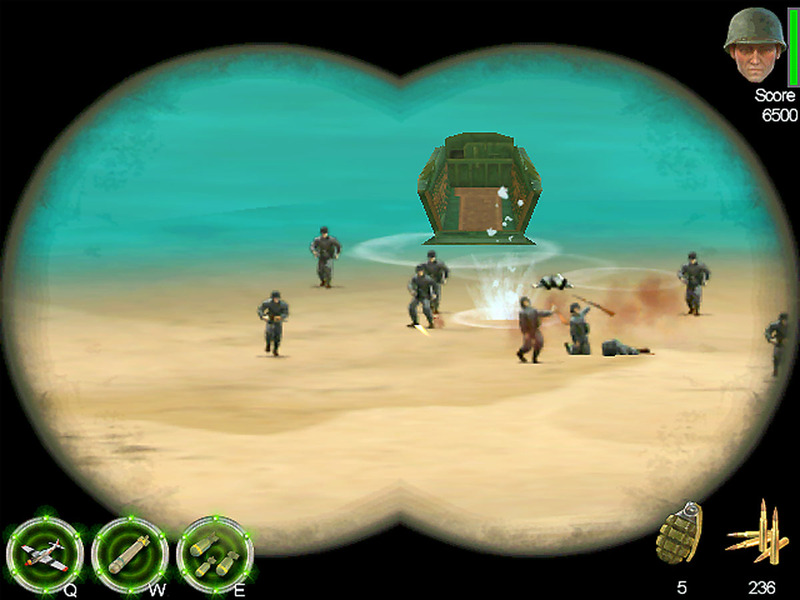 The Tigers have to be hit in a certain way with the bazooka or they won’t blow, although this isn’t too difficult to do. Especially unique is the binocular view; as mentioned, it is brought up with a right-click and hold of the mouse. You can fire weapons in this mode as well, which I believe offers greater accuracy once you get used to how the different weapons perform in that view. It’s also the preferred method of cutting down infantry on the beach; you can almost see their agonized faces through the thin, wispy clouds of blood that appear when you hit them. 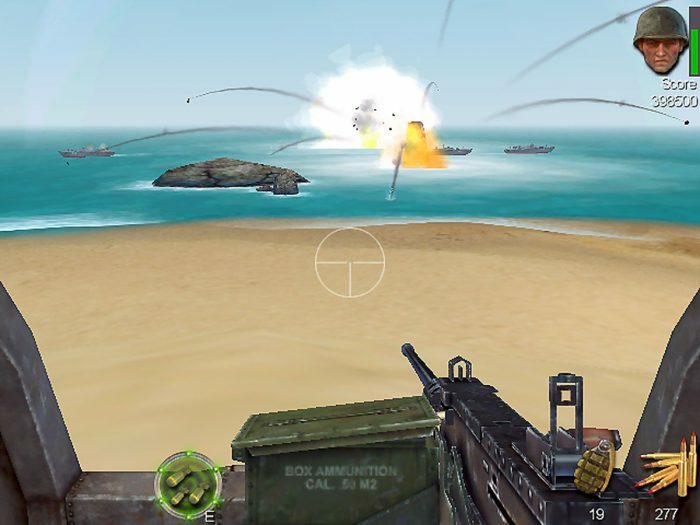 Also, when using the machinegun (either single or quad .50 cal), the player’s view shakes from the fire effect, in perfect time with the staccato hammer sound of the recoil. And the sound…well, I actually wince every time a fighter crashes near the turret – the sound of bending, exploding metal experiencing deceleration trauma is believable. Things blowing up farther away sound fainter; bombs dropped on a player make you feel like you’re in the middle of a 1,000-bomber raid on Berlin, with whining, high-pitched screeches – dozens of them – accompanying the Thor hammer-like hits around your position. In fact, the sound makes for a useful assistant “spotter” of sorts. 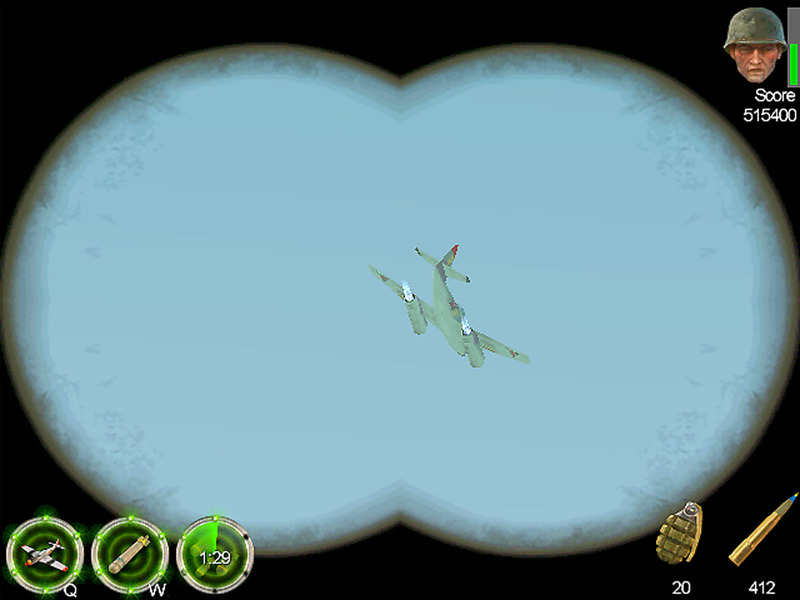 Many a time I was distracted trying to off a carrier or heavy cruiser, or whittle down a few of the bee-like swarming fighters above, and didn’t notice infantry or tanks landing on my shores. 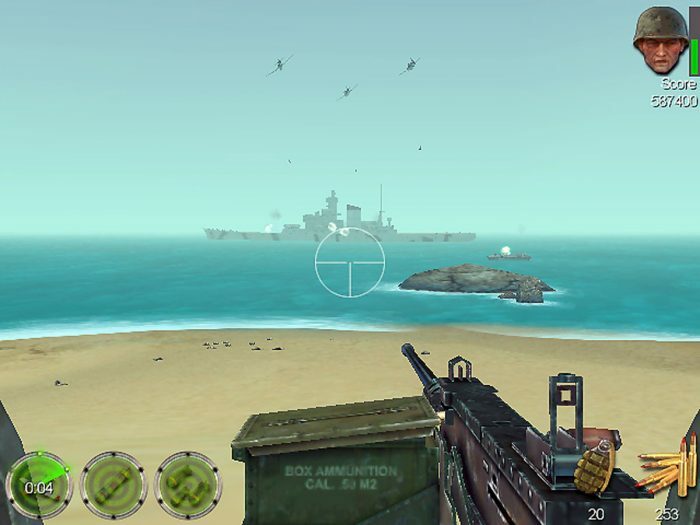 The sound of rifle fire is distinctive, and an immediate tip-off for a player to man a machinegun. The louder the rifle fire, the closer they are. The detail is great; little things like jet exhaust were nice additions. These jets go down just as easily when charging head on into your guns, but are harder to hit using deflection because of their speed. Occasionally a “special mission” with a voice-over comes along, briefing the gamer on what’s expected for that particular mission. The voice is clear and easy to understand, unlike his counterpart, who will radio you on occasion while you’re in the turret. The sound quality immediately goes from golden to ten-year-old-battered-drive-through-speaker as I tried to strain to understand. This is used sometimes to give you additional objectives, very important if you wish to win the scenario successfully. 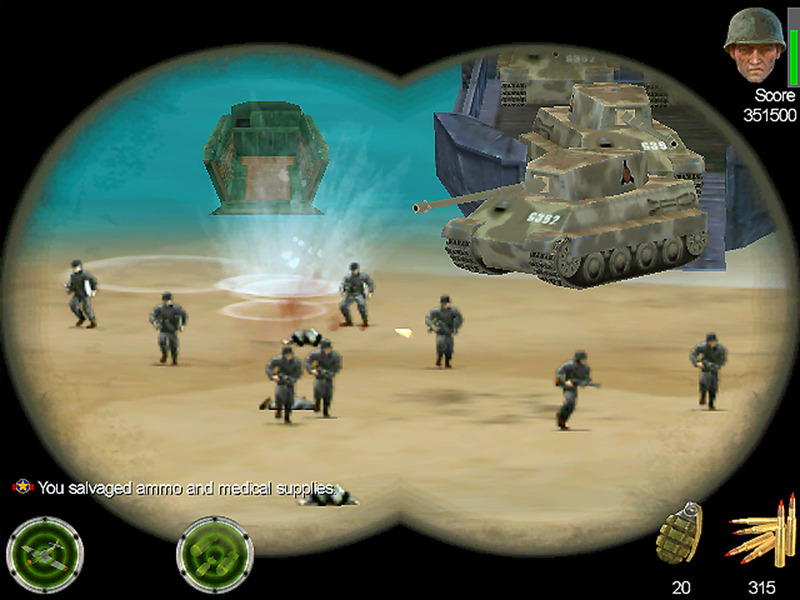 Fortunately, the game provides a list in the upper left-hand corner of the screen, reminding you of the new objectives. They’re self-explanatory, making the funky radio-speaker transmission thing a forgivable offense. I could have done without the ad-libbing “Ye-haws” and “Boo-yahs” from the speakers, which is apparently the player’s soldier crying out with pleasure as he blows up yet another enemy ship or plane. There’s about eight or so responses, and they get old real quick…although, they do have a use by “telling” you when a ship gets sunk (some of the larger ships take more hits to sink, and if you’re using the binocular view – which you’ll have to for accuracy’s sake – you may not see the explosion that signifies the ship’s death) by shouting out. Your controls consist of a mouse and four keys – Q, W, E, and G. The right button, if held, brings up your binoculars, and the left button fires. It’s very easy to get used to these controls; move the mouse to move your turret a full 360 degrees around and 90 degrees up and down (although the howitzer won’t aim straight up). Interestingly, the type of weapon that you have displayed dictates the speed of the scroll. Your howitzer doesn’t move nearly as quickly as the machinegun view or 20mm cannon view, for instance. The Q, W, and E keys control summoning of air cover, torpedo planes, and bombers respectively. A reminder in the lower left corner shows you which of the weapons are available, and a countdown ticker tells you how long before they will be available again once used. The air cover appears for about a minute or so and sticks around until shot down or time runs out – there’s no clock counting down this time, so I’m not certain how long it is. 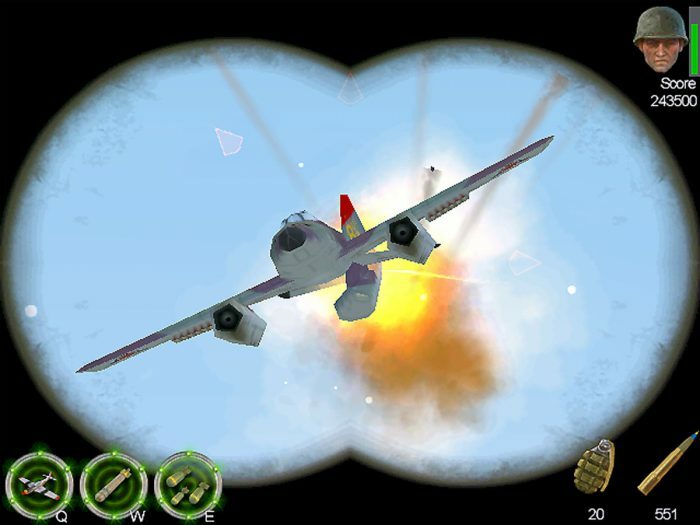 The aircraft change from P-38’s early in the game to the P-51’s of the later war. Pressing W brings in a trio of torpedo planes, who will attack whatever target you are viewing at the moment; a player needs to be careful that they’re not aiming the planes at a tiny destroyer instead of the Tirpitz behind it. The bombers attack the ground units that land on the island; I like to think of this key as sort of a “smart bomb” (as in the ancient Defender coin-op) that blasts all infantry on the island to shreds, and takes care of the lighter tanks as well. Don’t overdo it with these three keys – they’re a finite resource, with the fighter cover only coming twice or so before the option disappears. Three torpedo planes make a run on this Saruvian battleship. The G key is for grenades, and can be thrown in a small area designated by the player; these aren’t used nearly as often, as it’s much easier to just hit E and let the bombers do their work if there’s that many infantry assaulting. 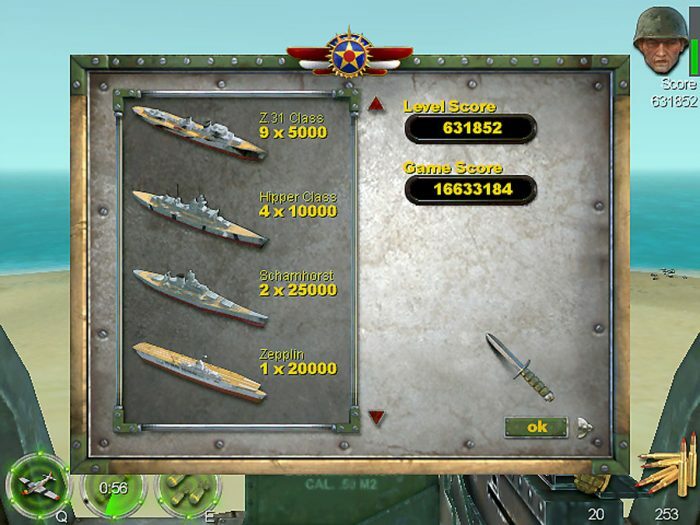 You score points by sinking and destroying the enemy, although there’s very little realistic way of measuring this against a scale. By 1945 I had amassed some twenty million points, and while this sounds impressive I couldn’t help but wonder if I was in the midst of a Monty Hall game show. I would have preferred some kind of rank structure, starting with private and working my way up, to give goals and point levels to (pardon the pun) shoot for instead of just arbitrarily showering me with points (as in a pinball game). What the British would have done in WWII for such impressive counts. The game’s AI is pretty good, as enemy forces react appropriately to your attacks. PT boats slow to shoot at the player, and when the player shoots back they increase speed to evade. When fighters fly by and the player shoots at them from behind, they jink to avoid. And, firing a howitzer at the enemy’s bigger ships makes the turrets turn early to face you. The lifelike reactions help make the game something much more than a simple upgrade of Space Invaders. I was surprised to discover one fine aspect of sneakiness of this game: Between waves in one mission, a lone fighter appeared and buzzed nearby. As I focused on shooting him down, the powerful whine of falling bombs soon came to my ears and, looking up, I discovered three bombers trying to plaster my position. The little fighter was a diversion from the bombers. Well…no, not really. 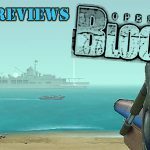 Operation: Blockade is stand-alone, and even with a few dozen scenarios spanning the World War II era, once it’s over…it’s over. You can go back and play any of the scenarios that you’ve been through, and of course start a new game, but once you’ve gone through it the only thing that could possibly bring you back to it is the smooth and destructive gameplay. There is a multi-player aspect to this game, although I’ll be darned if I can figure it out. You can access the menu through the game’s main menu, and it gives you the option of hosting a game or joining a game. Clicking on either caused my machine to sit for several minutes as I drummed my fingers impatiently. The lack of clear instructions in the manual didn’t help much, so I gave up in frustration after waiting for about ten minutes. I would have liked to see how multi-player is supported in this game; after all, it is a single-player shoot-em-up. I can only surmise that it is a head-to-head points competition. Again, useful documentation would have helped me explain this a heck of a lot better. However, I just can’t see how multiplayer could be enjoyable, since there’s no true us-versus-them mode that I could find. Mindless shooting, mixed with pretty graphics and good sound effects made this title a nice diversion to blow off a little steam. I was determined to conquer it, drawn to it every evening after work. After finishing, I was rewarded with a nice shiny medal and a speech from the President (who, incidentally, sounded a lot like JFK), which was an interesting touch. Fade to black, roll credits. There’s a ton of missions involved, so it’s not like a gamer could have been bored during the trip. It’s somewhat limited, but it is fun. Fans of shooting things up will like this title, even more so if you like the World War II era. Just keep in mind that this is all you’ll be doing; the graphics and sound are good, and probably the only reason I kept coming back – the explosions are quite satisfying.